Eleven Hookers Hooking! .... and Stomping! And yes the class last night was just that! Eleven hookers hooking and a little foot stomping as well! 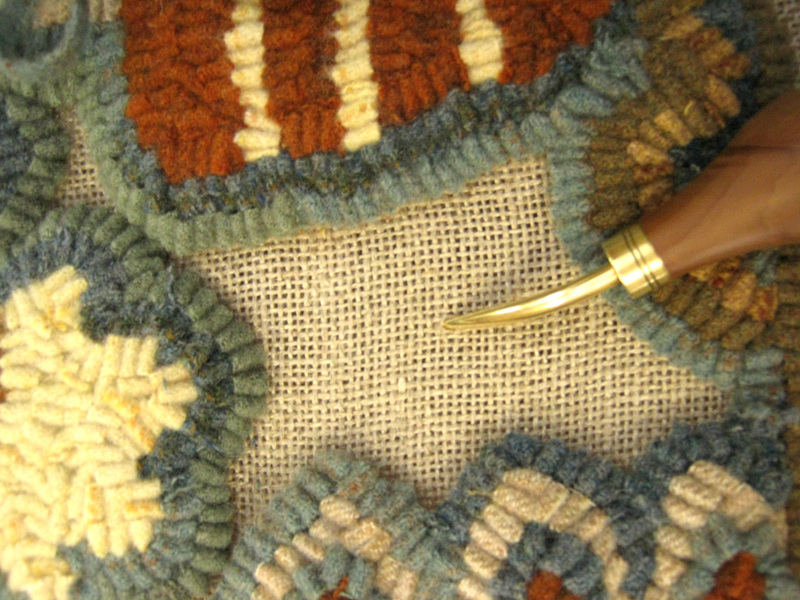 The beginning rug hooking class last evening was a roaring success! I couldn't have asked for a more energetic, nice, fun and lovely group of ladies! I love it when a class is so eager to learn that you can hear a pin drop in the room and not one person ( that I could see) was texting or talking on their phones! No siree! 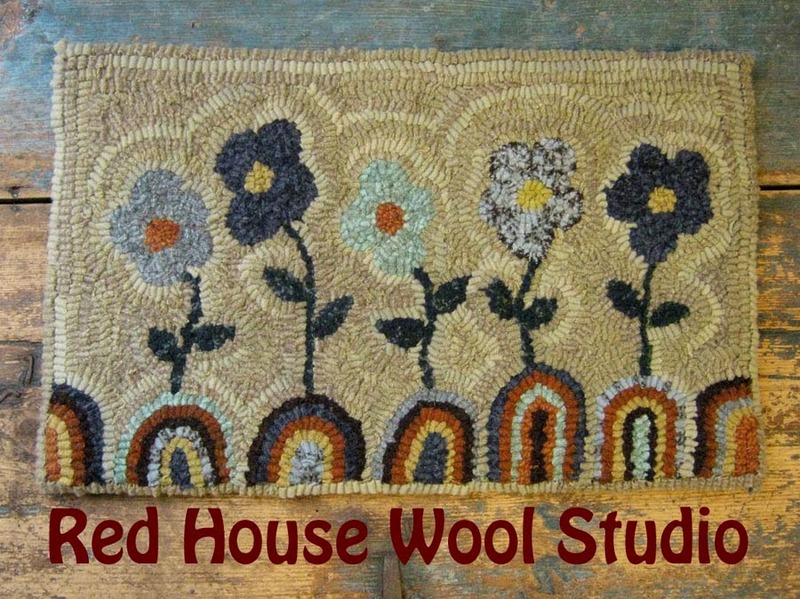 These are gals who want to learn how to hook rugs! My heart skipped a beat or two also when I pulled the little finished project I had designed for them out of my bag! Gosh... they were squealing with delight and I heard such wonderful comments... I swear they went on for two entire minutes! My head swelled two sizes I'm sure of it! I was well rewarded for all my work and worry in those two minutes! 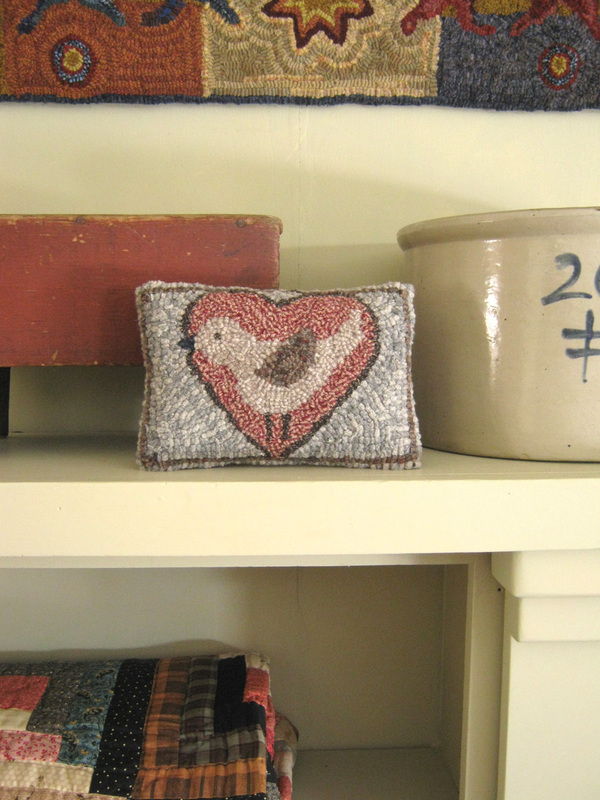 I've named the little project Snow Bird in Heart. It came about as I was thinking how lucky those people are I know who fly out of here in the winter for warmer climes then return like the birds in early Spring and Summer. We call them Snow Birds. My dream is to fly this coop during Winter some day too! But until that day I plan to continue my efforts to teach classes and meet as many lovely people as I can. At least three ladies drove over two hours last night to attend my class! Thank goodness we had good roads and the snow didn't start until early this morning.... we are nearing 6 inches of the white stuff as I type this. Two of the students are left handed! A first for me to teach someone who is left handed to hook! But they did just fine! They are hooking right along and figuring out what to do! Does any one know of any hooks they'd recommend for left handed hookers? Oh yes.... about that stomping that occurred! 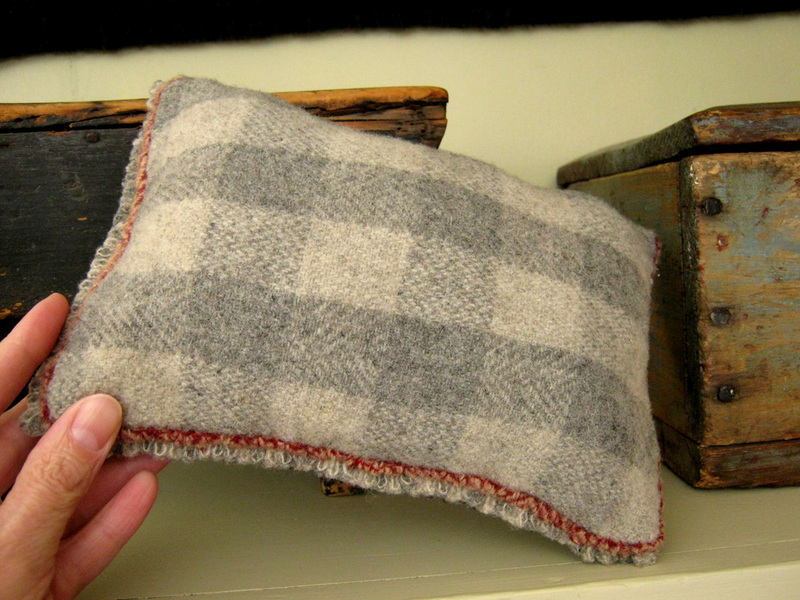 I had just finished my part in my presentation about protecting your wool stash from moth infestation... 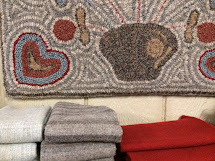 I always stress how important it is to not bring wool into your house that you don't buy new... as from a thrift shop etc. until you can throw it in the washer and dryer. 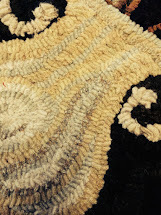 Maybe I go a little overboard but so many people don't even think of this when they are starting out hooking rugs. Anyway... they were all gathered around me in a circle while I was instructing how to pull their first loops when out of nowhere... I am not kidding here.... a little moth or miller or winged creature of that kind landed on the floor right in the middle of things... someone said " Oh No... look! A Moth!" And the stomping and whooping and fun began! All eleven ladies made quick work of that little intruder and we were all laughing so hard we had tears streaking down our faces! So what are the odds of a moth in the dead of winter in a big school room land right in the middle of a wool rug hooking class?!! Could be a sign... of what I'm not sure! 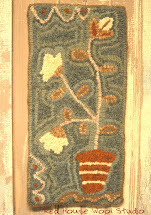 Rug Hooking Class to Begin and Something New On My Frame! It is only hours away from the start of my beginning rug hooking class at Wisconsin Indianhead Technical College tomorrow evening at 6:00 PM. 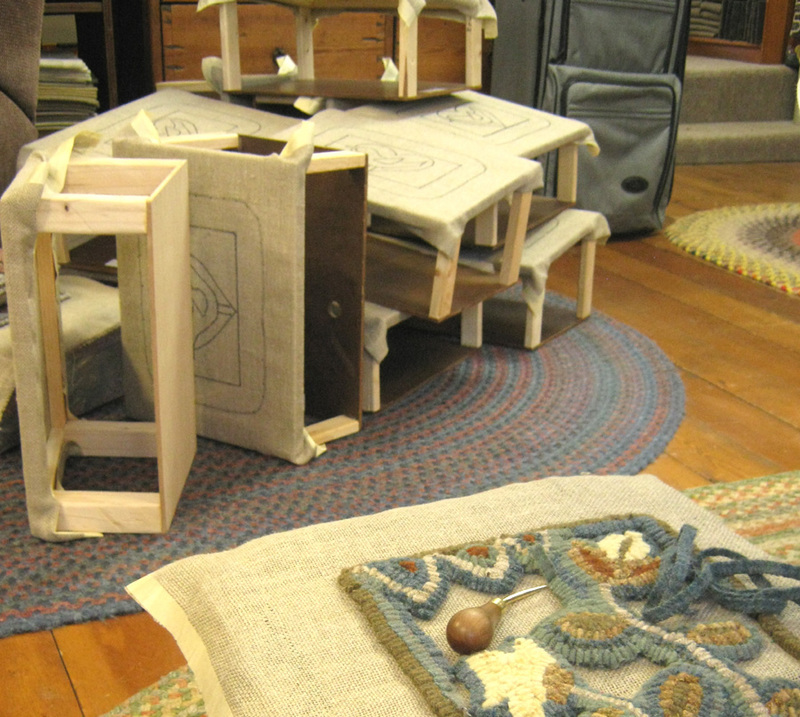 All eleven frames are ready with the projects attached, the wool kits packed and the pile of things to load in the car is almost complete! It's been quite a few late nights in a row for me since I started to get things ready for this class! I mentioned to Dave when he came home for lunch today that all I had left to do was get my outline written down on paper. He laughed saying I'd better get going on that! In all the past classes I've taught I had stuff written down that I had intended to follow and then somewhere in the course of things the list gets ignored and things just kind of progress naturally. But the first session of this three session class has to keep on track. It's a challenge to cover everything in the two hours we have. It goes by so quickly.... so I'm always glad we have two more sessions to cover more material. 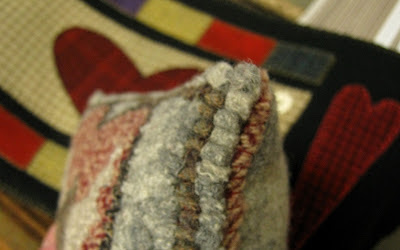 Last night I had this idea for a new rug grab hold of me! It HAD to be drawn on linen and wool pulled in colors I had envisioned and partially hooked to see if I liked it! I think I do! I'm hooking in an 8.5 size strip so it's going real quickly. I'm thinking maybe it will be a new paper pattern... we shall see. 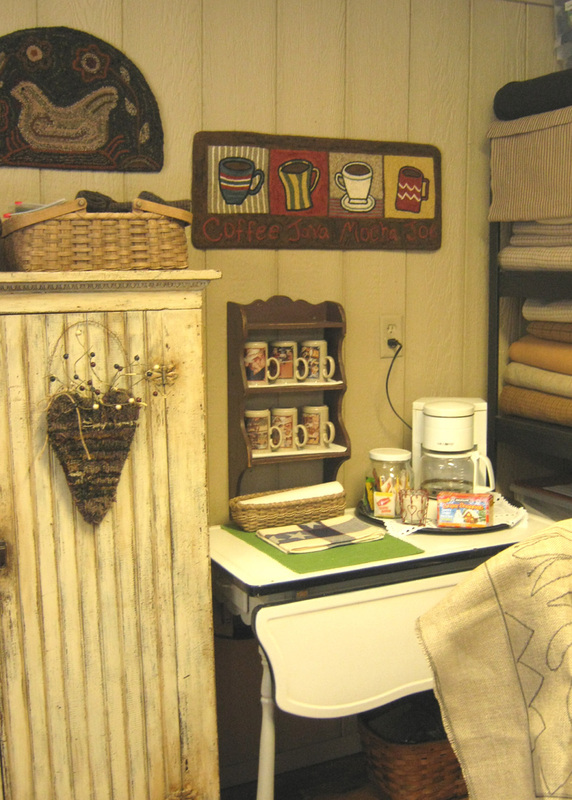 I'll get my classes underway and then back to the designing table. Gosh.. everything takes so much time in this business! Maybe it's just me getting old! LOL! I'd much rather think like a saying I once heard... " I'm not getting old... I just need to be repotted!" It's the inspiration for my new design! 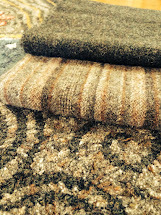 And of course all the new wools on the shelves around here! Well that big snow storm is staying south of us! Whew! If you live down around Kansas City stay safe my friends! At least when it snows down there it doesn't stick around too long! We have sub zero temps here still.... oh but next week is supposed to warm up... to 35 degrees! I'll believe it when I feel it!! 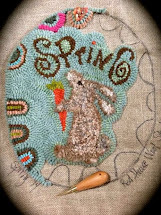 Spring in Swing on Primitive Handmades Mercantile! As I sit typing this my fingers are flying but freezing as well! Another cold cold but sunny day here in the northland! We are purposely keeping the thermostat down to around 66 or 67 degrees these days. The firewood is almost gone! Ahhhhh .... but there is a glimmer of hope... 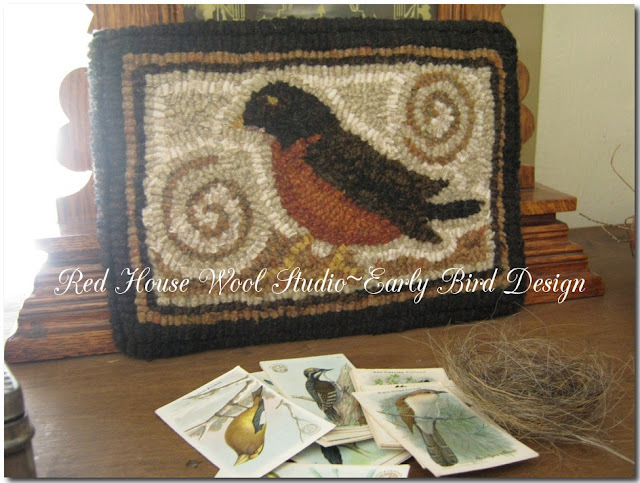 I spied the first Robin of the season! 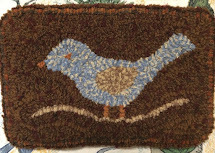 Unfortunately not a real one but in my latest little hooked mat that I've offered for sale over at the Primitive Handmades Mercantile selling blog. Have you been over there yet to check out Spring in full swing? 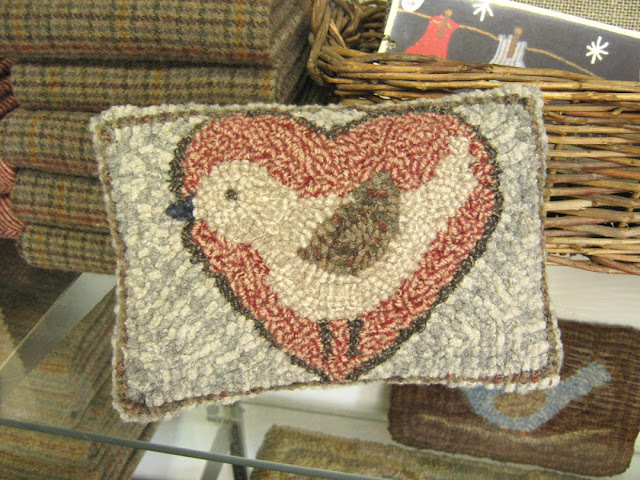 Bunnies, hooked rugs and more are flying off the site! 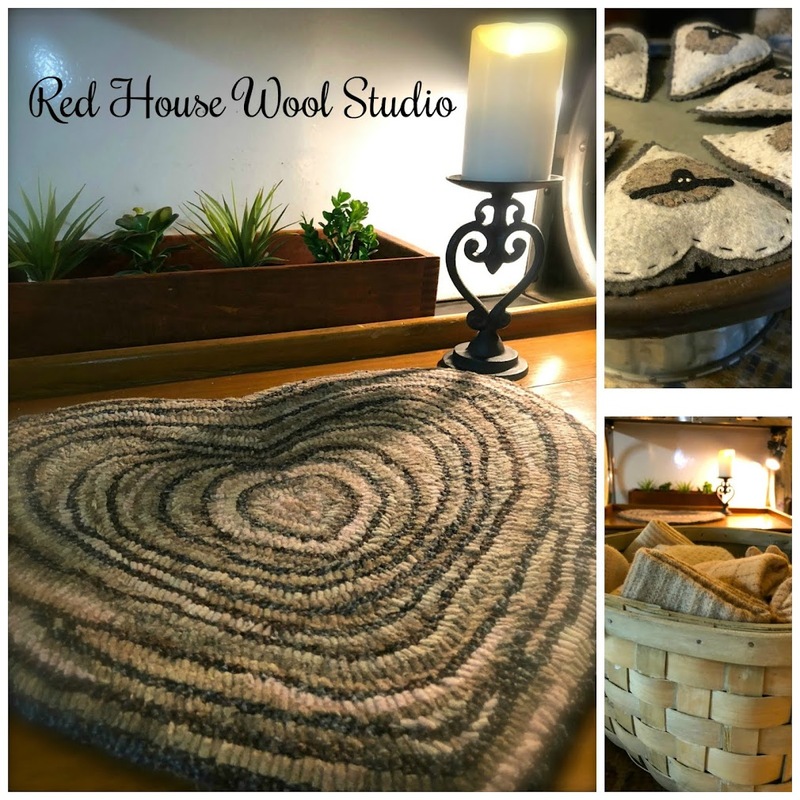 Soooo many wonderful creations... there are some wool wrapped Easter eggs that one of our new sellers Michelle from OldeFarmHouseSimples is offering! What could be more charming than a woolen egg in luscious colors! I want a bowl full! 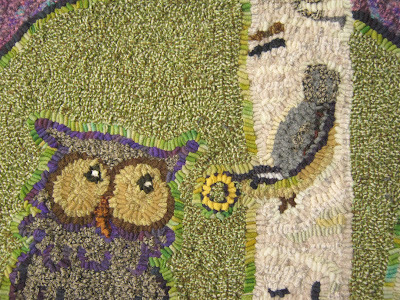 I am so excited about my upcoming beginning rug hooking classes at our local technical college! There are at present eleven students signed up! Oh how that makes my heart beat faster! 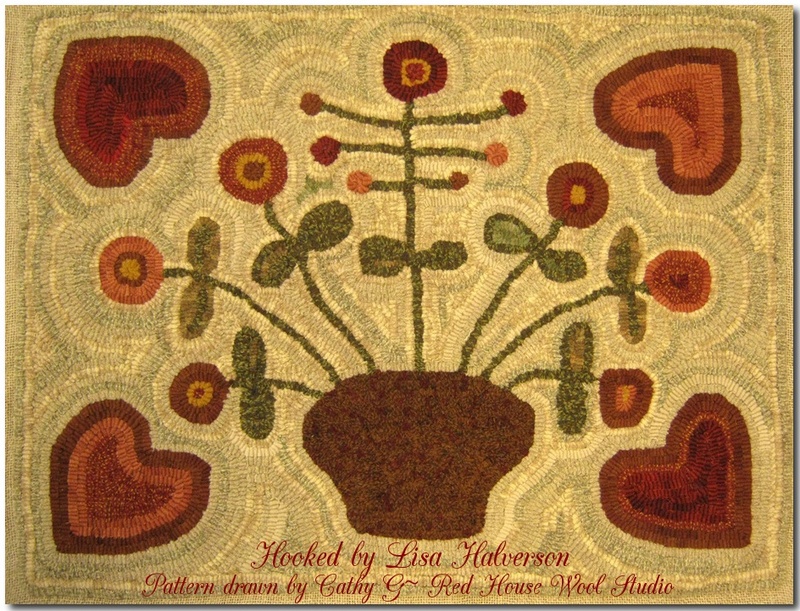 My visions of a big rug hooking group right here in Rice Lake, Wisconsin is nearer with each class to becoming a reality! So this weekend will be spent getting the patterns and frames and little details all ready to go! There is snow predicted again towards the end of next week... a little snow won't stop a hardy northern WI gal from venturing out in the evening, but if it should be another huge dumping of the white stuff it could put a different light on things.. but we shall see how it all plays out! One way or another the class will prevail even if it has to be postponed! So get your scissors ready if you are one of the students signed up already! That's all you need bring to class and the urge to have some fun! Hookers just wanna have fun you know.... and make lots of rugs!! Be Still My Heart! ~Two Posts On One Day!!! Two posts on one day!! I know... first I don't post at all... then two on one day!! 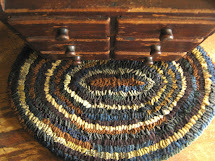 But I just couldn't let Valentines Day go by without sharing this gorgeous rug my friend Lisa just finished hooking! 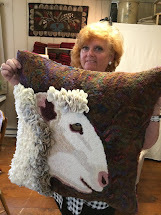 Remember she's only been hooking rugs for less than a year! I am steam pressing it for her today and she has to bind it.... but oh I can't stop looking at it!! Lisa my lovely lady... you are my inspiration! 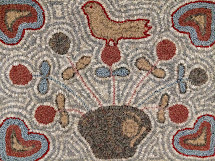 And that's not all... she's taken to drawing up some of her own patterns to hook.... wait til' you see! Again.... May your heart go pitter patter on this day of Hearts! Valentines Wishes! ... and a PHM Peek! Wishing you a bowl full of love and sweet things this Valentines Day! A Little Burst of Creativity! A couple of days ago I had a little creative burst that came out of nowhere! 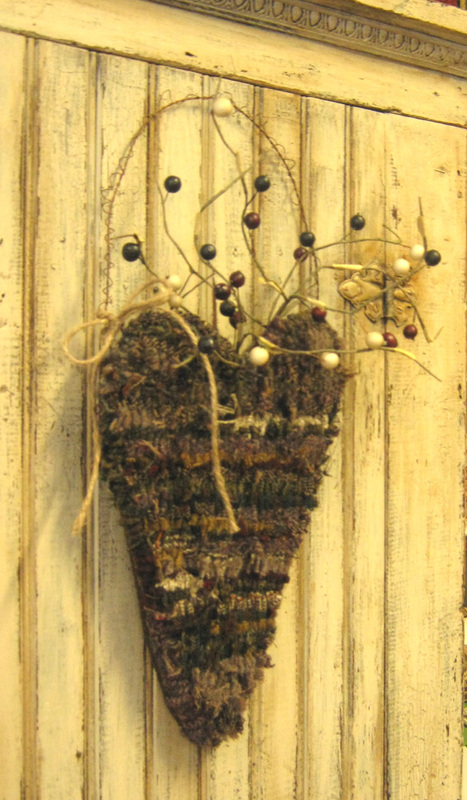 I kept envisioning some type of hooked hanging heart with a lot of texture.... like a birds nest with sticks and fibers entwined to create a hanging pocket of sorts. The photo above shows what I created. 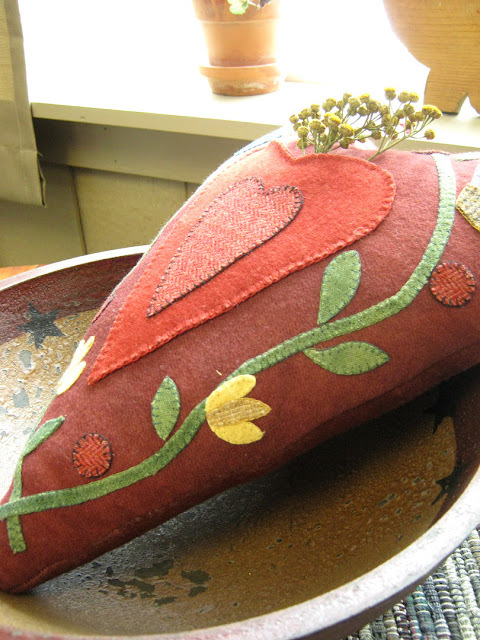 I lined the inside with burlap and added a felted backing so things could be tucked inside. The handle is wrapped rusty wire. There are even scraps of linen backing hooked into the design. Interesting. I wondered what would happen and if it would work. I liked the effect. 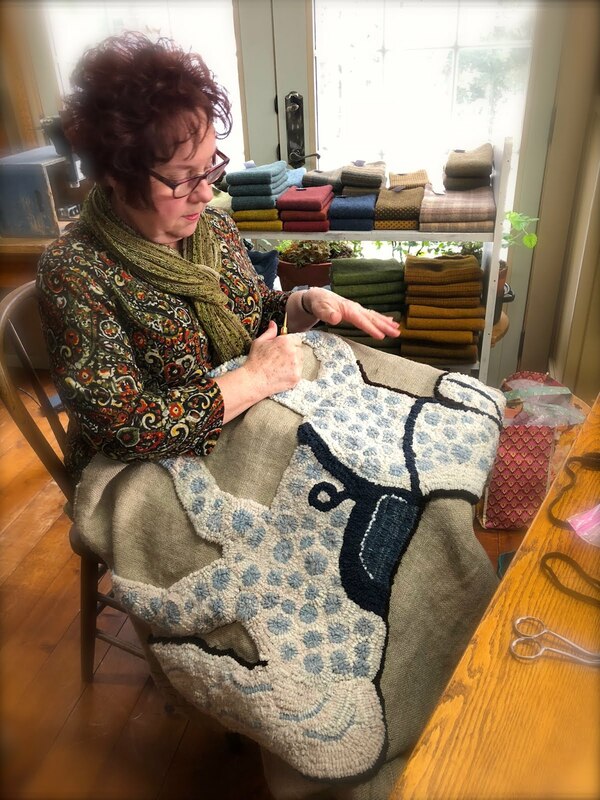 I was in creative bliss and thinking like a bird on warm spring day picking what she could find from her surroundings and weaving it into her nest. Hopefully those of you in the path of this big winter storm traveling north and eastward stay safe! 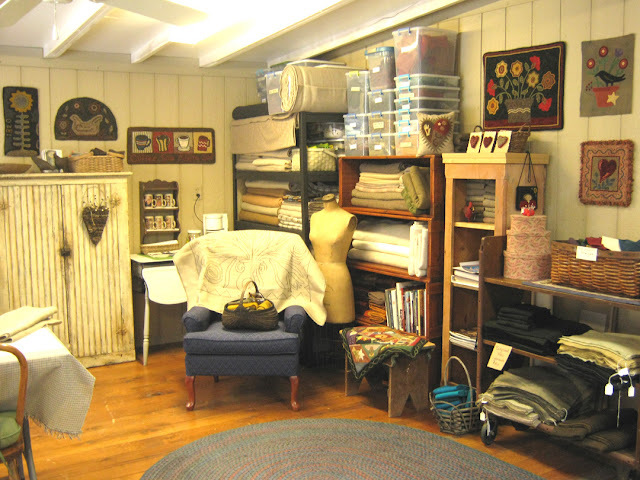 Sounds like a good time to stay home and get some hooking and stitching done on those projects! I will be putting the kits together for my beginning rug hooking class that starts on Feb. 21st and hooking on the Mr. Chill rug for a customer. And you never know... I may just get another burst of creative energy! I don't know about you but come February I always find myself struggling to get through the days and maintain some sort of hope and positive attitude. We live in a part of the country where waking to 15 degrees below zero each morning gets mighty old after a few days. Uhhh huh!! 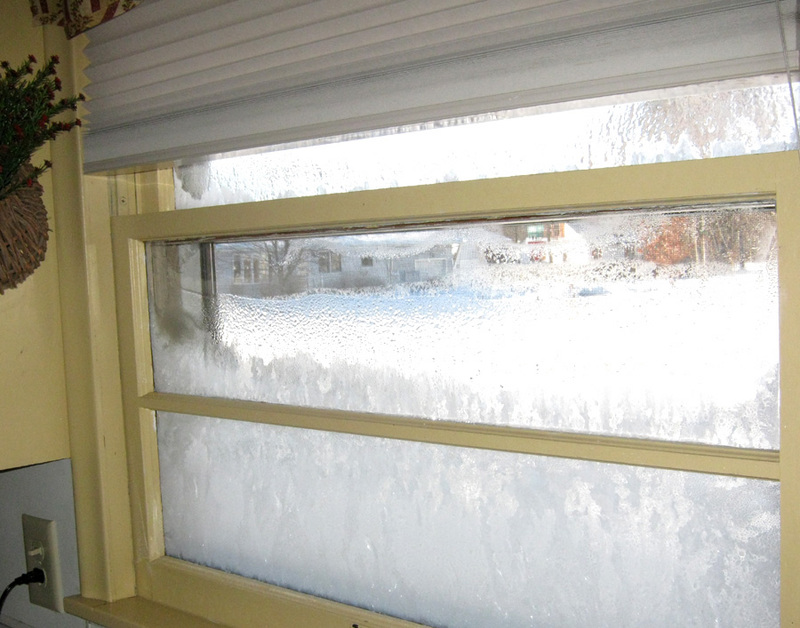 That is ice on the INSIDE of the window! I kid you not! Granted, our windows need replacing pretty badly... but c'mon... who needs this when you see other people showing on their blogs taking walks outside on a balmy Spring day in February! 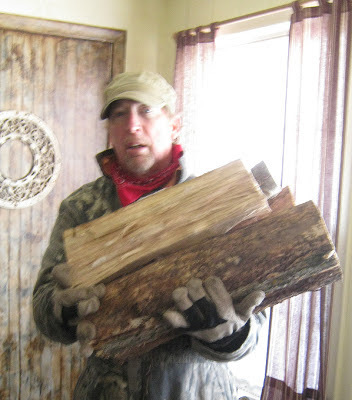 Dave carrying in another load of firewood for our wood stove. 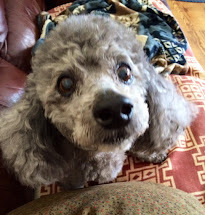 The picture is sort of blurry as I could barely get him to stand still long enough to snap a photo! It's important work and he likes the workout he gets going up and down our basement stairs with chunks of wood for weights! Crazy man! But it is one thing for which to be grateful. It keeps the gas bill to a minimum and there's nothing like a warm wood fire going in the evenings to keep the ice on the OUTSIDE of the windows thank-you! Each year Dave likes to make a calendar with some of his wildlife photography and gives one to a couple of his friends ( his Mom gets one too) and me! I have it in my studio and enjoy flipping to the next months photo when the first arrives. Except for today...LOL! More ice! Don't get me wrong... 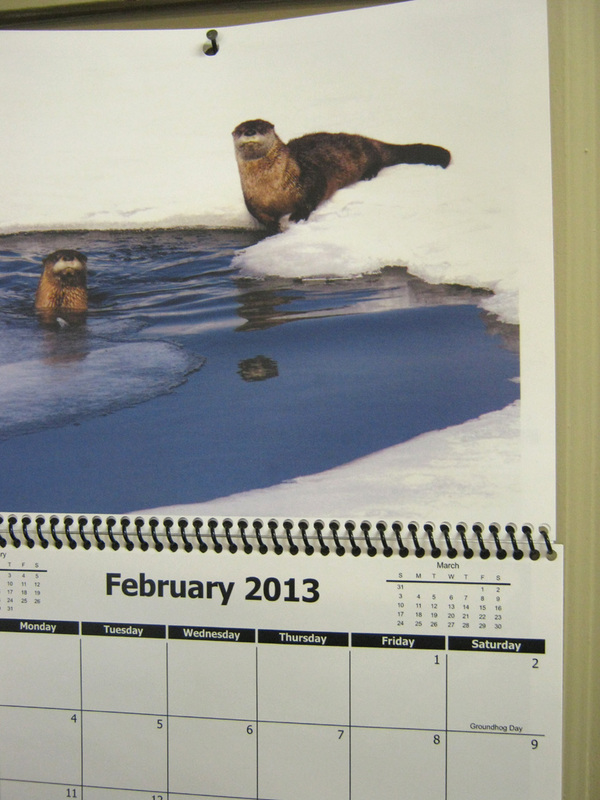 I LOVE this photo he took of the otters playing in a frozen pond... but I didn't need to see more dang ICE this morning! 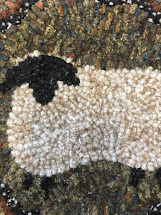 Even though I'm keeping extremely busy this year with all things related to the wool business, preparing for upcoming classes, dreaming up new projects etc. it's still hard sometimes to try and keep a positive outlook! 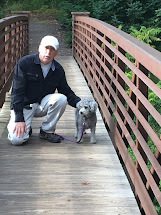 It helps to take each days little accomplishments and relish each one. 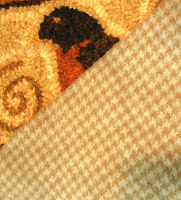 Like the project above.... finally... after 3 or 4 attempts I think I finally have a project for the class that I'm satisfied with! I'll share more as soon as I can.... got to go chisel some ice off the window.... if I'm lucky there might be enough to make a snow cone! !